The end product is pretty nice. The slings have a nice feel and should hold up pretty well. The design is "clean" and efficient, while looking authentically primitive at the same time. It is interesting to note that knitting is a relatively recent technology. No Romans for instance, and many of what we think of as great textile cultures (including south/central america) had no knowledge of knitting. Most accounts have it introduced to europe by the moors. The colonists (and especially the missionaries) then spread it throughout the world. Surprising when you think of the simplicity compared to a lot of the techniques that were in place pre-contact. The tarred twine makes a nice sling, but doesn't photograph at all well. 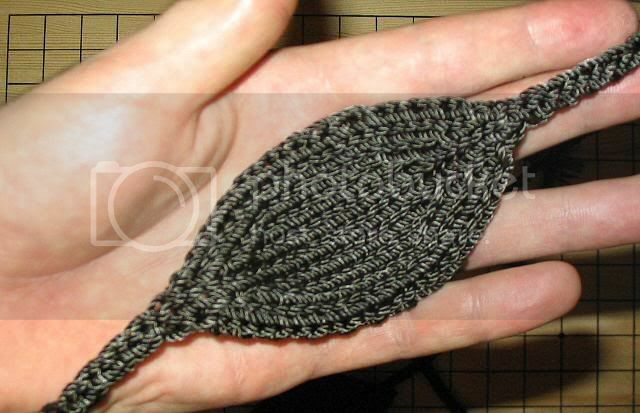 Here you can see the shaping in the pouch and the "I-cord" release/retention lines. 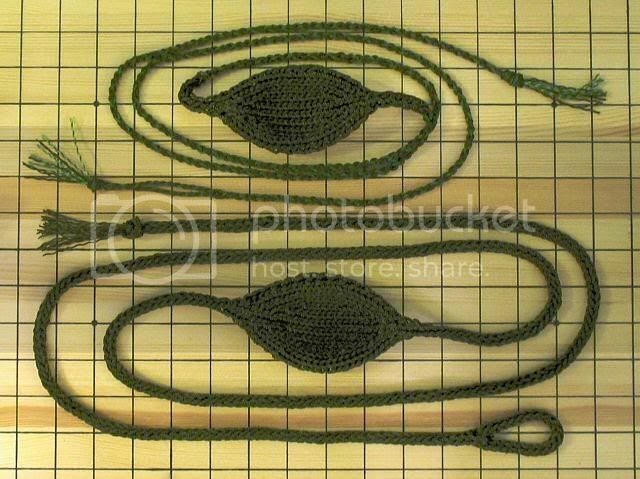 The cords are 3 knit-stitch I-cord. It turns out that 2 stitches would have worked very nicely as an alternative (and taken 30% less time). One of the nicer things about knitting is that smoothly tapering the cords is a piece of cake. The pouch is worked in stockinette, with 4 stitches carried parallel to the edge and a curved/tapered insert for the shaping. The pocket has a "chain" edge to stabilise the knit and give a clean selvedge. The edge is achieved by slipping the first stitch of every row purlwise and knitting the last stitch. Sorry for the terrible picture... You can also see that the shaping adds a nice amount of concavity to the pouch. 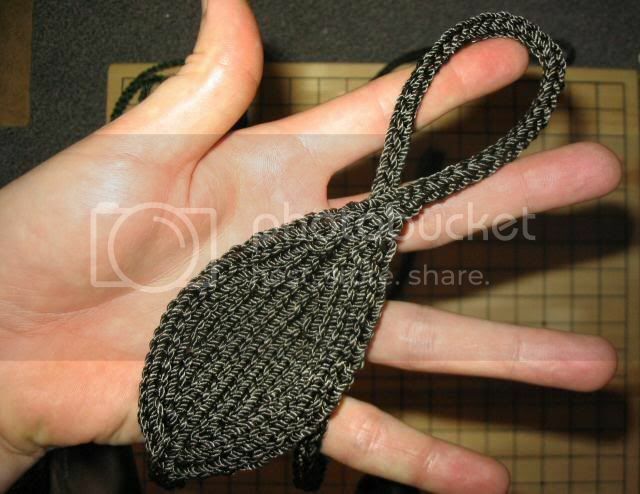 Here is the "prototype" with the braided cords. All you need to do to join the cords with no knot is to loop each string through a stitch (one of three). 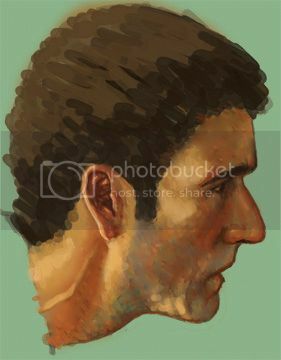 No knots! and it locks the stitches at the same time. In this sling, I've picked up two stitches with one of the strings so I have two strings doubled to give me four strands for the round spiral braid. Another shot showing the I-cord a little better. No 18 seine twine on 4mm double-pointed needles. m1 = make 1, I've used invisible increases created by working a yarn over, and then knitting the YO as a twisted stitch the subsequent row. For both increases and decreases, I've used symmetric stitches for the left and right side as appropriate. For the increases this means working the twists so that the loop slants to the outside. The decreases are k2tog and SSK or slip 1, k1, psso. For the I-cord, k3 then slide the work to the other end of the DP, bring the working strand behind and repeat until you have about 4 inches. Transfer the second row of stitches to a second needle and unwork the cast on edge. Move the 3 tail end stitches to the first needle and work the stiches in pairs as k2tog to join. weave the cast on tail in to the Icord as you progress. Continue working in I-cord until you have the desired length. This was written from memory, so may not be quite right... should be close though. 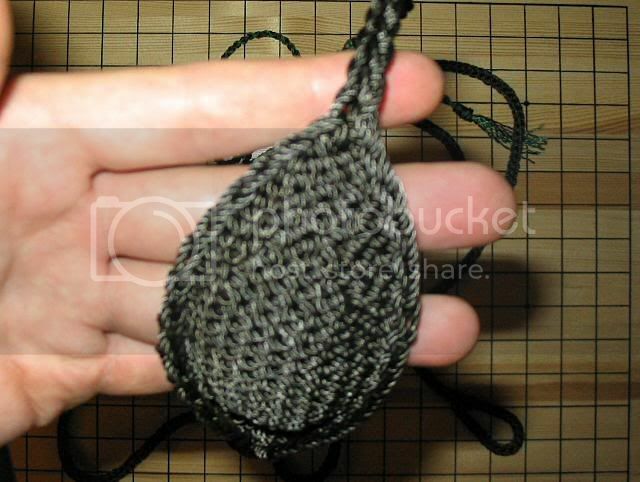 That's a smooth, smooth design:o I've never seen such seamless transition from cord to pouch, like it's all one piece of rope with a flattened center. Knitting, huh? Darn it, another hobby I've got to take up! Those are real nice looking slings! Do they stretch when slinging a rock? Matthias, you are the cordage master. That looks really great. Wow, now I must make one of those! Guess it means one more book to my many-books-to-purchase list. Good thing that my birthday is getting near, so that I'll maybe get some extra financial support. I *strongly* recommend buying her a new set of needles or two though if you want to stay in the good books. More so if you are crazy enough to spec tarred twine (I _think_ the stains will come out) Needles are dirt cheap though, so it seems like a fair trade. Another thing to mention is that the gauge and twine diameter/needle size ratio I've used is pretty tight to give a nice solid structure. It is definitely a "workout" to manhandle the stitches. the increase/decreases in particular are tough. A crochet hook might be the best bet for manipulating some of the tougher spots. Johnny - a true knit (as opposed to a jersey knit like a t-shirt) is usually stretchy across the fabric. Lengthwise once you've set the stitches it is pretty stiff. The stretch in the all-knit sling is "possibly" a tiny bit more than one of the braided slings of the same material - maybe an inch total with as much force as I can reasonably put in... Nylon is pretty stretchy stuff to start with and I'd say that 90% of this stretch is in the yarn. That looks great. I knit also. I'm going to put that on my next projects to do list. Weird looking game. I remember reading about it in a guide to Japan or something, but I can't remember anything about it. Great strategical game! Years ago I played GO sometimes. My problem was to meet a partner. I also tried to play with my wife, but I was winning almost every time, while she hates to lose at any play... you know So I was forced to play with a computer. I could never get my head wrapped around GO. I can see how the pieces in chess attack, cordon off sections of the board, trap other pieces, etc., but I can't seem to see an overall picture on a GO board 'til it's too late. Kudos to anyone who can play this game well! Ok, I admit that I'm bumping this thread... With all the recent posts about dropping rocks out of sling pockets and skinny split cradles, as well as the huge number of new slingers around lately I figure this deserves another go around. NICE pattern, Matthias. 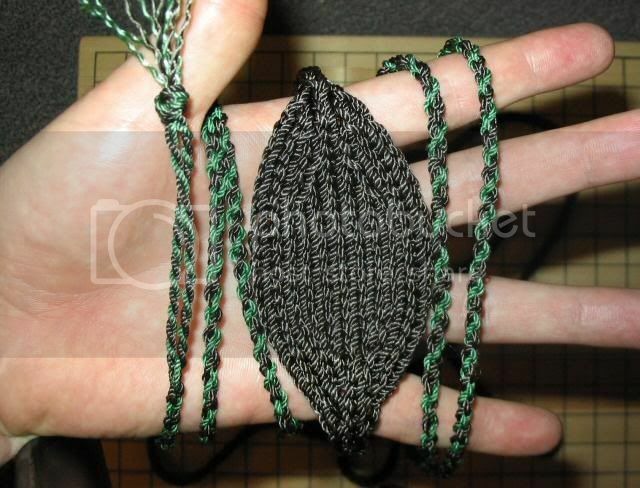 I knit some, and crochet too, and actually made my first sling by knitting a square very much like a gauge swatch, then attaching pieces of antenna cord (some odd but rather strong material ordered online) to the four corners. It worked, and my friends in the "swordfighting with wooden dowels" club I belong to liked it. They like the braided ones better, though, as it turns out.